Saturday morning. It snowed last night. Christmas tree is lit. I’m on my second mug of strong, black coffee (why, Haitian, of course). In front of me on the coffee table are two ethnic nativities (I have collected many over the years). 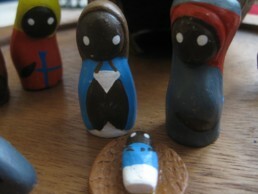 One of them is first ethnic nativity I ever purchased. I found it in Haiti in the early 90’s during one of my early trips. It’s interesting how inanimate objects invoke nostalgia. Our tree is full of sentimental relics of Christmases past. My little Haitian nativity is such a relic, too. It reminds me. It reminds me that Jesus is not mine, but ours. That He came not to be just my personal little American Jesus, held close for safekeeping. He’s Dede’s Jesus. And Miss Vero’s and Maitre Rousvel’s Jesus too. And Jean Tinne’s and Aldo’s and Mme Sami’s and Madame Felicien’s and Merline’s and Jean Rony’s and Mickenson’s and Jean Bena’s. Jesus is Emmanuel. God with US, not God with just me. He is Emmanuel to the people living in the huts on the salt flats and up in the tiny mountain villages. His birth is celebrated not just in my cozy, comfortable American church, but in precious groups of worshipers all over the island of La Gonave, too. 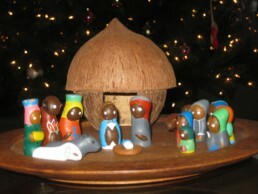 Sometimes when I set out my Haitian nativity, with its coconut stable and crudely carved manger guests, I wonder if maybe it, in its stark simplicity, isn’t a more realistic rendition of how it was.